Dark in the Song is committed to leading the development of an adventurous and diverse new body of repertoire for bassoon. By working directly with composers to commission new pieces, performing, recording, arranging, educating audiences, and teaching a new generation of open-minded players, we seek to bring the bassoon and bassoon ensembles to the forefront of 21st century music-making. Called a “bassoon supergroup” by the American Music Center, Dark in the Song was formed in 2010 by five of the most dynamic and accomplished young players and teachers in the U.S. Its members bring an eclectic, wide-ranging mix of sensibilities and experiences to the group. We have performed and lived on five continents, premiered works by many of the world’s leading composers, collaborated with the world’s most acclaimed musicians, recorded widely, played in venues ranging from the finest concert halls to bars and nightclubs, and performed with rock groups, leading symphony orchestras, and acclaimed chamber music series. Since 2015, Dark in the Song has sponsored an annually sponsored The NewBassoon Institute. The week-long workshop focuses on contemporary bassoon literature, performance techniques, and pedagogy. In 2019 it will take place in Chestertown, MD as part of the National Music Festival and feature guest artist bassoonist and composer Brad Balliett. Dark in the Song are members of the Rushes Ensemble, formed to record and perform an hour-long composition titled Rushes, for seven bassoons by composer and Bang on a Can co-founder, Michael Gordon. Commissioned as part of the New Music Bassoon Commissioning Fund, it was premiered in 2012 at the Experimental Media and Performing Arts Center (EMPAC) in Troy, NY. Rushes Ensemble continues to tour it around the world with performances throughout Europe, Canada, and the US. The album Rushes is available from Cantaloupe Music and iTunes. We see ourselves as active participants in the continuing conversation between the vast range of musical styles that now make up contemporary art music – from modernism and the avant-garde to minimalism, popular music and rock, electronica, and folk and traditional music from around the world. If you’d like to join in the conversation, be it from the point of view of a composer, listener, performer, educator, patron, arts presenter, or curious onlooker, please don’t hesitate to contact us. Originally from Vermont’s Northeast Kingdom, Rachael Elliott is now based in Durham, North Carolina. She performs in a variety of chamber music settings including Dark in the Song, Clogs, Vermont Contemporary Music Ensemble, Heliand Trio and Tuple bassoon duo. She is also a frequent guest with the Vermont Symphony and Burlington Chamber Orchestra. With Clogs, Rachael has produced five albums and toured throughout the United States, Europe and Australia. She has appeared as bassoon soloist with the Vermont Symphony, Montpelier Chamber Orchestra and University of Vermont Symphony Orchestra, and performed on rock stages with bands including The National, My Brightest Diamond and Sufjan Stevens. Rachael teaches bassoon at the University of Vermont, Middlebury College and during the summer at Kinhaven Music School. Michael Harley enjoys a diverse career as a teacher, performer, and music advocate. At the University of South Carolina he teaches bassoon and courses in music history and contemporary music, coaches chamber music, and is artistic director of the award-winning Southern Exposure New Music Series. Past full-time teaching positions include posts at Ohio University, Wright State University, and Goshen College. His performances have been called “spectacular” (Washington Post) and “exquisite” (Columbus Dispatch). A proponent of contemporary music, Mike is a founding member of the acclaimed chamber orchestra Alarm Will Sound, called “one of the most vital and original ensembles on the American musical scene” (New York Times). He has worked with and premiered pieces by many of today’s most distinguished composers, including John Adams, Derek Bermel, Stefan Freund, Michael Gordon, Aaron Jay Kernis, David Lang, Steve Reich, Roger Reynolds, Wolfgang Rihm, Augusta Read Thomas, and Ken Ueno. A versatile musician, Mike has been featured as a soloist with AWS both as a bassoonist and singer. AWS can be heard on the Nonesuch, Cantaloupe, and Sweetspot record labels. Mike has played in diverse venues on four continents, ranging from nightclubs and bars (Le Poisson Rouge and the Roxy in NYC) to Lincoln Center, Carnegie Hall, Walt Disney Concert Hall, the Barbican (London), the Hermitage Theatre (St. Petersburg), and Johannesburg, South Africa’s Town Hall; and with groups including the indy rock group Dirty Projectors and the orchestras of Charleston, Columbus, Fort Wayne, South Bend, and Long Bay (Myrtle Beach), where he is principal bassoon. Current chamber projects include the experimental chamber ensemble LotUS and the Chiaroscuro Trio (flute, bassoon, and piano). Mike has degrees from the Eastman School of Music (D.M.A. ), where he was awarded the Performer’s Certificate, the Cincinnati College-Conservatory of Music (M.M. ), and Goshen College (B.A., English and music). His teachers include John Hunt, William Winstead, and Gwendolyn Rose. He lives in Columbia, South Carolina with his wife, U.S.C. flute professor Jennifer Parker-Harley, and daughters Ella and Lucia. Lynn Hileman is in demand throughout the US as a recitalist specializing in contemporary music, appearing most recently at the Washington State University Festival of Contemporary Art Music and the Florida Electroacoustic Music Festival. She is Assistant Professor of Bassoon at West Virginia University, principal bassoonist of the Binghamton Philharmonic Orchestra and a member of the Laureate Quintet. Lynn is also co-founder and former president of A|V Space, a gallery and performance space in Rochester, NY specializing in interdisciplinary and multimedia works. She holds degrees from the Eastman School of Music, Yale University, and the University of Michigan, where her teachers included John Hunt, K. David Van Hoesen, Frank Morelli, Christopher Millard, and Richard Beene. Called “stunningly virtuosic” by The New York Times and “superb” by the The Washington Post, bassoonist Peter Kolkay claimed First Prize at the Concert Artists Guild International Competition in 2002 and was awarded an Avery Fisher Career Grant in 2004. He is an Artist of the Chamber Music Society of Lincoln Center and a member of the IRIS Orchestra in Germantown, Tenn. He is Associate Professor of Bassoon at the Blair School of Music at Vanderbilt University. Current season highlights include a recording of Stravinsky’s L’histoire du soldat, a chamber music appearance on the String Theory series in Chattanooga, and a solo performance at Bargemusic in Brooklyn, N.Y. Kolkay’s recent seasons have included solo recitals at Wolf Trap, Merkin Hall, St. Martin’s Abbey (Wash.), and the Teatro Nacional in Panama City; concerto appearances with the South Carolina, Rochester, and Westchester Philharmonics and Waukesha Symphony; and chamber music engagements at Music@Menlo, the Mainly Mozart Festival, the Spoleto USA Festival, and the Bridgehampton Chamber Music Festival. Kolkay actively engages with composers in the creation of new works. He recently performed the world premiere of Joan Tower’s bassoon concerto, Red Maple, with the South Carolina Philharmonic, and will premiere a new work for solo bassoon by Gordon Beeferman in February 2015. Kolkay has premiered solo and chamber works by Judah Adashi, Elliott Carter, Katherine Hoover, Harold Meltzer, Russell Platt, John Fitz Rogers, and Charles Wuorinen. His debut solo CD, titled BassoonMusic and released in August 2011 on CAG Records, spotlights works by 21st-century American composers. Kolkay was awarded the Carlos Surinach Prize by the BMI Foundation for outstanding service to American music by an emerging artist. Kolkay earned a doctorate from Yale University as a student of Frank Morelli and a master’s degree from the Eastman School of Music, where he studied with John Hunt and Jean Barr. A native of Naperville, Ill., Mr. Kolkay holds a bachelor’s degree from Lawrence University in Appleton, Wis., where he studied with Monte Perkins. His other interests include travel, modern and contemporary art, and mystery novels. Saxton Rose is Bassoon Professor and director of the contemporary music ensemble at the University of North Carolina School of the Arts, Principal Bassoonist of the Winston-Salem Symphony, and member of Zéphyros Winds. Recent performances include engagements as concerto soloist with the National Symphony of Colombia in Bogotá, the National Symphony of Panamá, the Puerto Rico Symphony Orchestra, the West Point Band, the Orquesta Sinfónica de Caldas, Fayetteville Symphony, and the Winston-Salem Symphony. This past season he performed recitals in Mexico, China, Belgium, The Netherlands, and in Berlin at the Philharmonie. As Principal Bassoonist of the Puerto Rico Symphony Orchestra from 2003 to 2008, he performed at Carnegie Hall, the Kennedy Center, in the Casals Festival, and on tours to Europe and throughout Latin America. Mr. Rose studied at the Cincinnati College-Conservatory of Music, and graduated with highest honors from the class of Stefano Canuti at the Conservatorio “Agostino Steffani” in Castelfranco-Veneto, Italy. 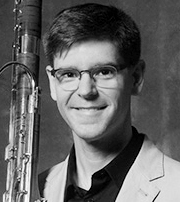 Saxton Rose is Associate Professor of Bassoon and director of the contemporary music ensemble at the University of North Carolina School of the Arts. Mr. Rose is one of America’s most recognized bassoon soloists and chamber musicians. He is Associate Professor of Bassoon and director of the contemporary music ensemble at the University of North Carolina School of the Arts, a member of Zéphyros Winds, an acclaimed New York-based wind quintet. He has appeared as concerto soloist throughout the world with orchestras such as the National Symphony of Colombia in Bogotá, National Symphony of Panamá, Puerto Rico Symphony Orchestra, with the West Point Band at the Skirball Center in New York City, and in North Carolina with Fayetteville Symphony Orchestra and Winston-Salem Symphony. As a recitalist this past season he performed in Japan, Argentina, Mexico, China, in Belgium at the Concertgebouw in Brugges, in The Netherlands at the Korzo Theater in The Hague and at the Ostadetheater in Amsterdam. He serves as Assistant Editor of the International Double Reed Society website and Chair of the Gillet-Fox International Bassoon Competition. Mr. Rose was Principal Bassoonist of the Puerto Rico Symphony Orchestra from 2003-2008 and has held the same position with Winston-Salem Symphony since 2008. He has performed as Principal Bassoonist with Orchestra of St. Luke’s and with new music ensembles such as Le Train Bleu, Wet Ink Ensemble, and Alarm Will Sound in Berlin at the Philharmonie. A committed teacher, he has been invited to give master classes throughout Europe, Latin America, Asia, and in the US at the finest music schools and conservatories such as the Central Conservatory in Beijing, University of Indiana Jacobs School, University of Michigan in Ann Arbor, and in Spain, Italy, Argentina, Costa Rica, Colombia, Panamá, Mexico, among many others. Mr. Rose studied at the Cincinnati College-Conservatory of Music, and graduated with highest honors from the class of Stefano Canuti at the Conservatorio “Agostino Steffani” in Castelfranco-Veneto, Italy. Saxton Rose is a J. Püchner artist and performs exclusively on the Model Superior/6000 bassoon. We had a terrific time at the 2018 Institute. Read about the institute, guest artist, performances and master classes. Dark in the Song will again sponsor an institute June 1-8, 2019 as part of the National Music Festival in Chestertown, Maryland on contemporary bassoon literature, performance techniques, and pedagogy. This year's guest is Brad Balliett.